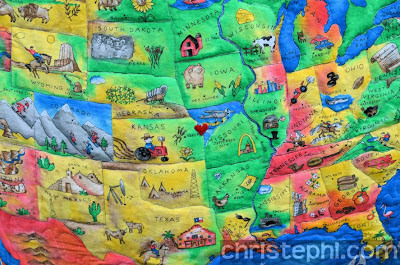 I saw this pretty United States panel print at JoAnn a few months ago -- on sale! 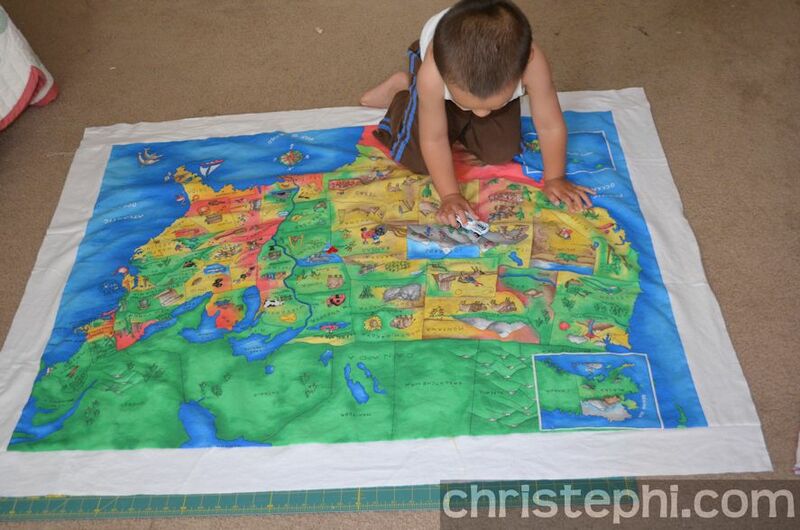 -- for just a few dollars and couldn't resist buying it. Such bright colors! 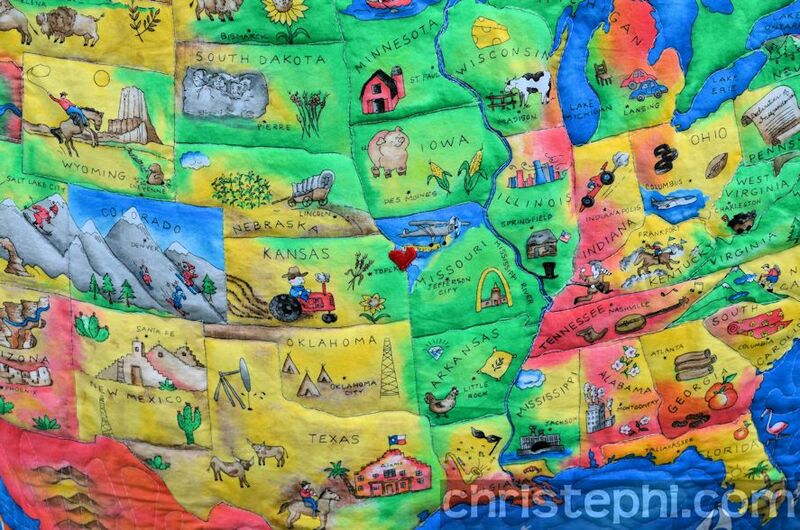 Such cute drawings on each state! Little Guy driving across the U.S. while it was still a work in progress! 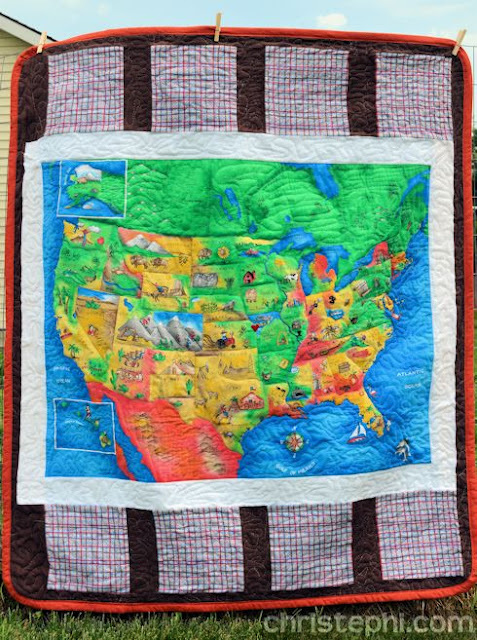 I've been thinking the kids need a more-kid-sized quilt since they're quickly outgrowing their toddler-sized ones. So I added sashing and some blocks from flannel I had left over from other projects. 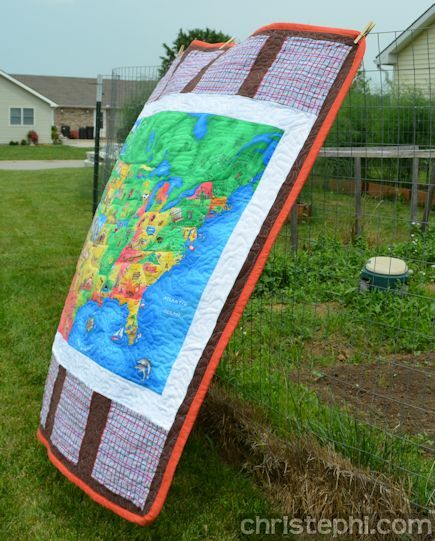 Finished quilt hanging on the garden fence. The resulting quilt is, well, I never actually measured it, but it's smaller than twin size and larger than crib size. 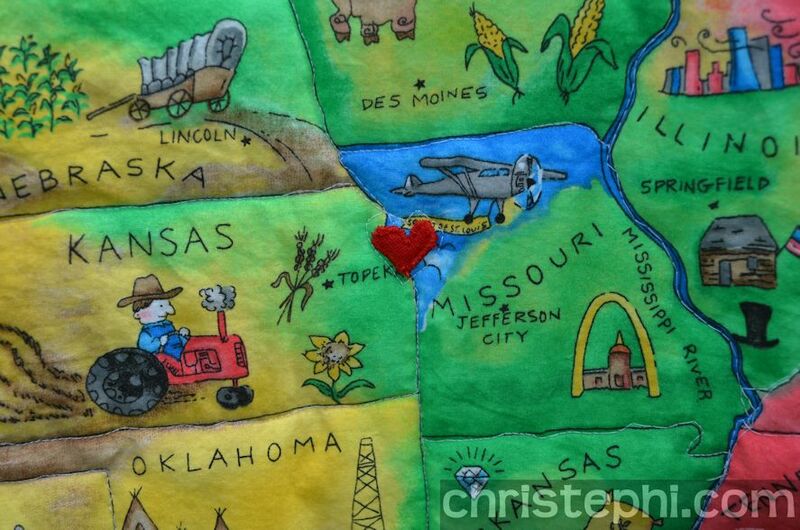 I used a scrap of red knit to put a heart in Missouri. The kids thought that was the coolest thing ever! 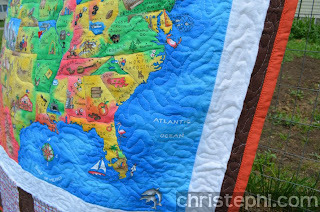 Uh oh, now I've posted a close-up shot and you can see my horrible attempt at free-motion quilting! It was my first attempt! I have a lot to learn (obviously), but it was so much fun and the kids don't care at all, so I made myself let go of my perfectionism and just went with it this time. The ocean turned out kind of cool and wave-like! It's Canada that is a bit scary to look too close at. Hehe! Hubby was funny when he saw me making it; he asked, "That's not for someone is it? I mean, it's for us, right?" I think he's been a bit jealous of the quilts I've made for others lately. He was delighted we'd be keeping this one! I love it! I can see why hubby didn't want to let it go. I'm sure the kids will have lots of fun with it.